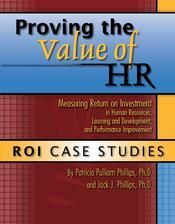 Based on their combined experience of more than 50 years in measuring and evaluating programs, Jack and Patti Phillips have compiled some of their favorite ROI case studies in this comprehensive, easy-to-use book - an essential companion to any reference on the ROI Methodology. Explore in-depth studies in human resources, learning and development, and performance improvement fields. Some of the real-world topics detailed in this book are preventing sexual harassment, machine operator training, stress management, safety incentives, executive leadership development, eLearning, performance management training, interactive selling skills, employee retention improvement, and more!